Recent research shows that the Monero cryptocurrency saw an increase in value of approximately 3000% in the last 12 months ending in March 2018. Therefore, cryptomining is expected to grow in popularity. It is making up an increasingly large portion of the threat landscape, and it is currently growing at an exponential rate. Cryptomining by employees, intentional or otherwise, may have securities regulation implications. It is a CPU-intensive process that can adversely affect industrial control systems—resulting in service degradation or outage. Data centers and public-facing servers are the types of CPU- and GPU-rich environments that cryptominers covet. Cryptomining software may be exploited by another party to launch an attack. 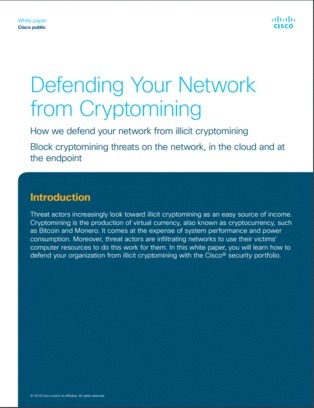 Download this white paper for more information on the topics related to cryptomining and how a security portfolio can protect you from these threats.